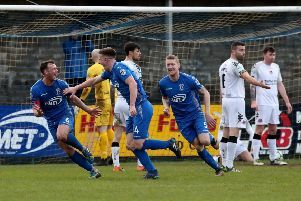 Dungannon Swifts manager Kris Lindsay knows his players will have to be at their very best if they want to get something out of the game when they entertain Crusaders on Saturday afternoon. Lindsay - the ex-Glenavon coach - has led a mini-revival at the Swifts as he has clawed them up from bottom of the league table to tenth. 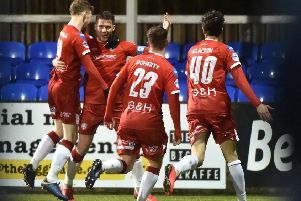 His side have had good wins against Coleraine, Cliftonville and Glentoran in recent weeks - but Lindsay knows Stephen Baxter’s Crues are a different proposition. “It will be a difficult game, we all know Crusaders quality. “They have a couple of injuries, but they have a big squad to cope with that. “They are a quality side with dangerous attacking players, and they have a good defence too. I think Colin Coates is back after suspension too, which will help them. “It’s a big game against one of the big teams, and we’re at home so we will be looking forward to it. “We need to get back to the levels we were at before the Coleraine game in order to get something from it. “We will approach it positively and see what we can take from the game. “We’re in the bottom six and when you face teams in the top six you aren’t going to win them all. “But it’s how you react to it and learn from it. “We have young players who should have learned a lot from the Coleraine game. “It’s how we approach Saturday now and see if we can bounce back from that defeat with a positive result. And Lindsay was disappointed that his side went down 2-0 to Coleraine on Tuesday night and believes his team were not at their best against Rodney McAree’s Bannsiders. “Coleraine took their two chances in the first half, outside of that it was a bit scrappy, but they managed the second half extremely well, and deserved the victory. “I said to our boys after the game, we can’t afford to have average games, especially against the teams in the top six. “You get punished, you saw that in the first half when they took their two chances and then saw the game out. “I’ll not be hard on our guys though as in the previous five games they have been excellent. “Now it’s important how we react and get back to the performance levels and energy we showed previously. “I’m not naive enough to think we would win every game between now and the end of the season, because it doesn’t work like that. “But it shows if we aren’t on top of our game, and make good decisions on the pitch, which we didn’t do overly well against Coleraine, then we will get punished. And the Swifts manager says his side have to make they must get back to playing their own brand of football. “Daniel Hughes would have given us a different dynamic, but I thought Michael Carvill worked extremely hard. “Both him and Paul McElroy were feeding off scraps at times. And Crusaders manager Stephen Baxter was pleased with his side after last Saturday’s Irish Cup win against Linfield at Windsor Park. “We had a bit of penetration about us, which we hadn’t had in our three previous games against Linfield. “We gifted Linfield a goal to let them back into it.